What’s almost as quirky as boho, but nearly as tidy as minimalism? It may be exposed brick wall, with a touch of violet in the center. Perhaps it’s pumpkin leather topping the steel bed frame. What about a shattered factory window filled with stained glass, or Bach floorboards covered with a fluffy old rug? They say your bedroom should be a sanctuary of peace and quiet, but that doesn’t mean that you’re not allowed to play with its décor. Perfect for soothing your urban neurosis, the decayed industrial genre brings the best of both worlds – bare corners on the left, and adjacency of patterns on the right. 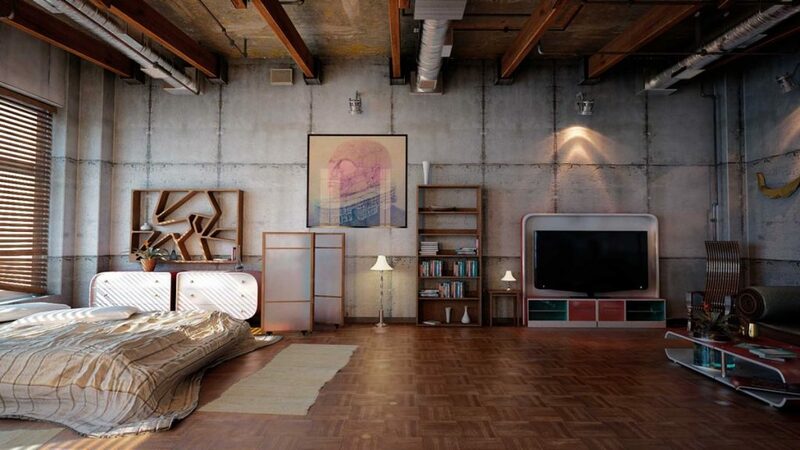 These are the 5 must-haves for your industrial-style bedroom. 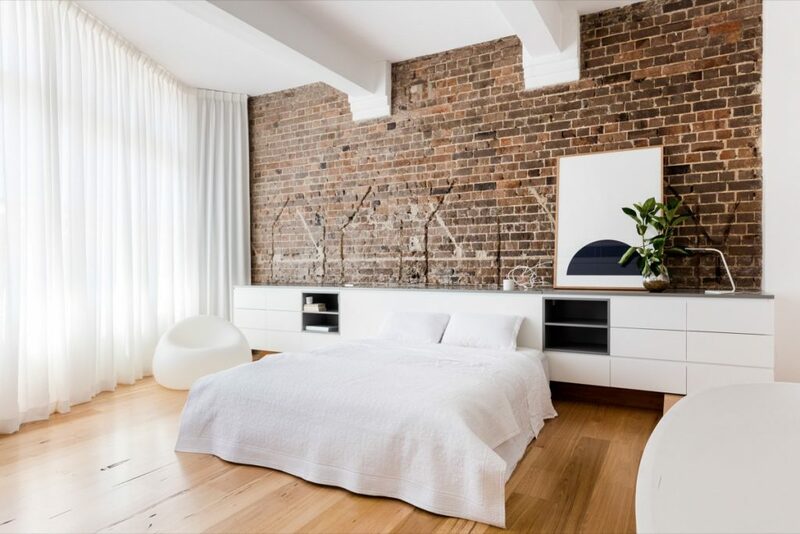 Exposed brick walls may just be the most discernible characteristic of an industrial style, particularly in reference to an old factory vibe. For a touch of minimalism, choose white bricks. For anything else, traditional red is a way to go. Hang a few grayscale photographs, or add quotes in chalky typography. Then again, you can make your walls concrete and play with different color palettes. Since grey is a gold standard for industrial interiors, light it up with yellow Tesla bulbs and warm artwork. Play with monochrome wallpapers, layered panels, antique wooden headboards, and of course, exposed pipes. The industrial-style décor traditionally depends on exposed pipes to provide a recognizable demarcated effect. They seamlessly pair with exposed bricks to create a rusty factory look and serve as both adorning elements and functional pieces. Let them crawl up the walls and all across the ceiling. On a crossroad between art and function, piped lighting adds to the raw, textured vibe of the industrial ambiance. Use it as a ceiling-wide installation, or DIY a copper pipe lamp as a nightstand detail. Alternatively, make a factory statement with steel hover lamps, grated ceiling fans, or caged lighting. When it comes to textures and patterns, the industrial style can go two ways. If you prefer your lines clean and bold, the room will lean towards minimalism. Combine low-set black furniture and white beddings with marquee letters and neon signs, or spice it up with old patent prints and antique maps. 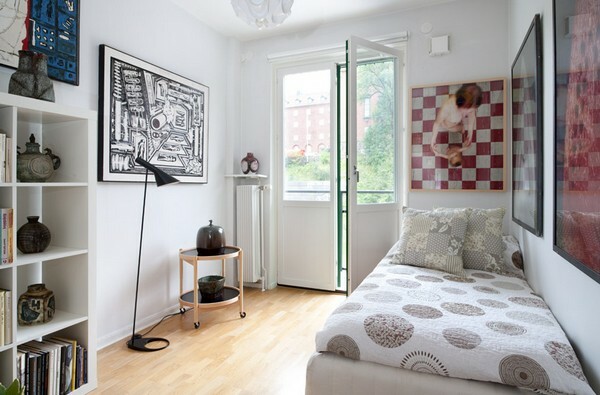 Another approach is to make your industrial bedroom mismatch on purpose. White draping against wooden floorboards paints a nostalgic, forlornly picture, while factory windows with steel glass ensure a playful pattern. Stained glass is another subtle, yet whimsical choice, amazing for bedroom lighting. Apart from wall artwork and factory lighting, the industrial-style décor can include a range of metal elements. Treat your books with a simple wire wall rack or create shelving with pipes and wooden boards. Instead of a nightstand, use a repurposed spring kitchen stool or just throw in a concrete block. Speaking of nightstands, the industrial style will provide a nice cover for your adult toys if you can manage to find a good old apothecary drawer unit. Wooden crates are always a good alternative to this; turn one upside down to make a table, or stack them on top of each other to create a pillow rack. 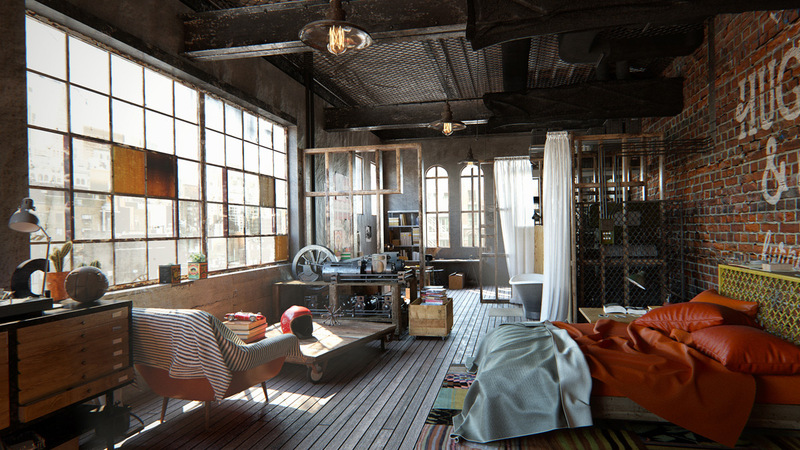 Without any windows to brighten the room, the industrial style tends to create a dim ambiance that’s perfect for lazy summer naps. But experts still warn that a bedroom should have lots of natural light, which is especially important for early risers. The smaller your chambers are, the more glass you need. Unless your bedroom is really spacious and open, you’ll need to add a lot of transparent elements to compensate for the lack of light. Here’s a brilliant industrial interior design hack – remove all furniture and add glass partitions to separate your closet from your bed. Or, throw in a big metal mirror or two. The industrial style provides a shelter from an urban jungle, effortlessly adding chic to an otherwise minimalistic space. Its aesthetic power comes from its simplicity, though this genre of interior design allows lots of different textures and patterns. Tidy and stylish, it’s a great choice for restless dreamers.